We’re constantly hearing about how rich people are wealth creators, job creators, the most productive members of our society, a bunch of Hank Reardons, bla bla bla ad infinitum, and how we should cut their taxes so that they can unleash their productive powers. The more intelligent-sounding purveyors of this point of view use sophisticated economic models to support their claims. But models are just that—they’re models of what should happen, given certain assumptions. And the real world is far more complex than any model can portray. The real way to understand what cutting taxes on the rich would do is: try it and see what happens. But I don’t recommend doing that. Why not? Because we already freaking did it. Many times. We know what happens when we cut taxes on the rich; we just choose not to remember. Thing is, back in the 1950s and 1960s, taxes on the rich were very high. Past a certain point, the government took almost all of your additional income—as much as 92 cents on the dollar. Yes, there were deductions; nobody paid 92% of their income. But a rich person deciding whether or not to earn an extra dollar had presumably already found all the deductions he could, so he really was faced with the prospect of working harder in order to earn only a few more cents. So back then when rich people said, hey, we would work harder and create more wealth if we were allowed to keep more of the reward, they were making a plausible argument. In fact, it was so plausible that we believed them and cut taxes. First to 70%, and then way below that. Meanwhile, we accepted higher taxes for ourselves and fewer services from government. 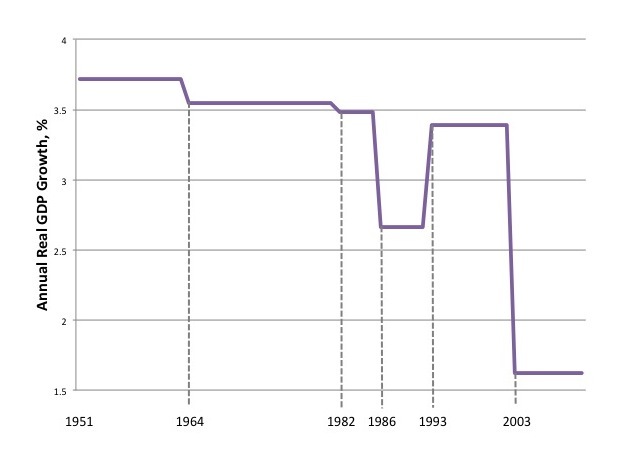 Here’s the maximum tax rate—the tax paid on income in the highest tax bracket—over time. 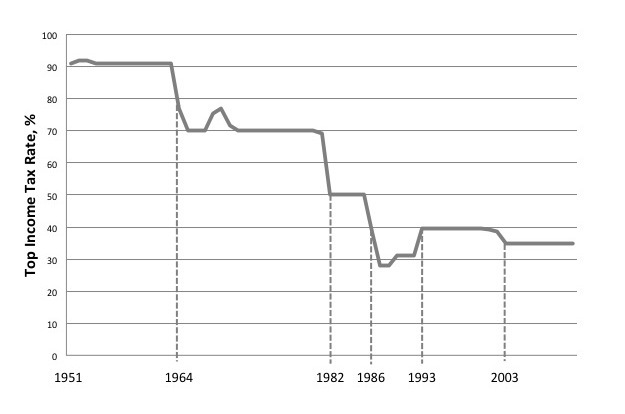 Note the big cuts in 1964 and in the 1980s, followed by Clinton’s 1993 tax increase, followed by Bush’s cuts. 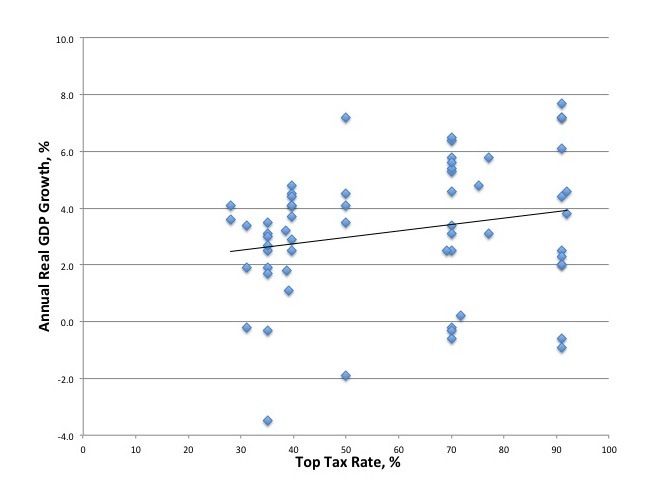 Now: If low taxes on the rich do what conservatives say, GDP should have been higher when the top tax rate was low, and lower when it was high and job creators were oppressed. 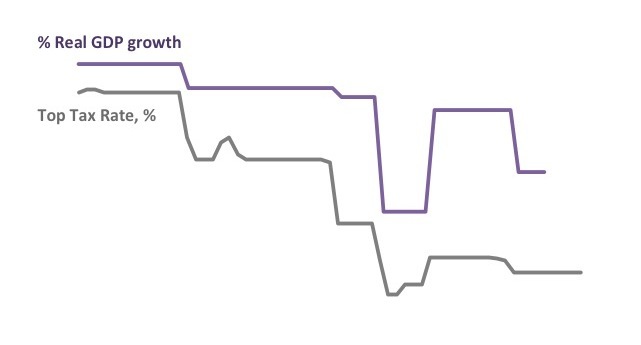 So here’s economic growth by year, courtesy of the Bureau of Economic Analysis. 2003 on, when Bush II cut it to 35%, where it remains today. Here’s what the averages look like. 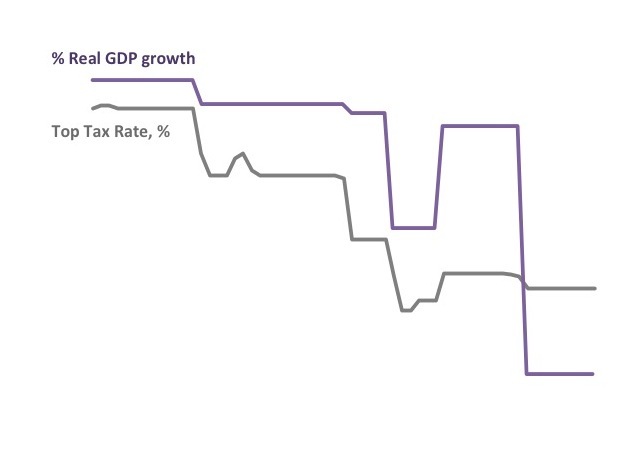 So low taxes for the rich haven’t been good for the economy. The association goes almost exactly the opposite way. And still the rich say that cutting their taxes will unleash their dormant productive powers. But if it hasn’t happened yet, it’s not going to happen. The only thing we can conclude is that rich people give themselves too much credit. 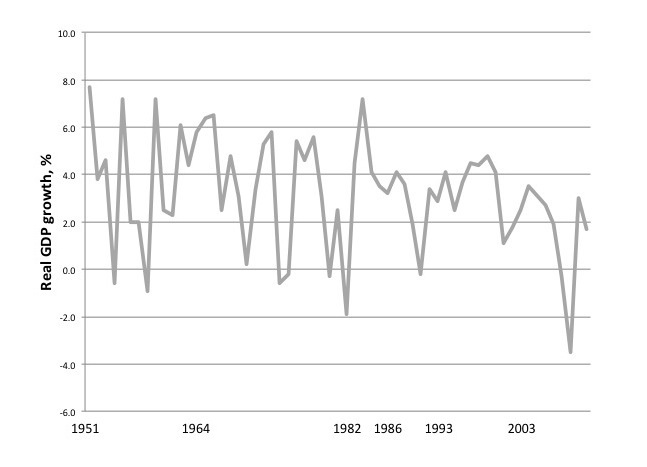 Now: You can play around with the exact periods you choose to average the data over, but the overall pattern will hold. Other people have cut the data in different ways and gotten the same result. They shy away from concluding that tax increases help the economy, and they’re right: none of this proves that tax cuts for the rich are bad for the economy, or that high taxes are good—there may have been other factors (like oil prices) that were more important. For that matter, it’s still possible that rich people really are job creators, and that they create more jobs when they’re motivated, but that high taxes are what motivate them. After all, rich people’s lives are almost all carrots and very few sticks; maybe the occasional blow from a stick will spur them to action more than another truckload of carrots. But all of this is beside the point. The point is that it’s simply impossible to look at the data and honestly think that cutting taxes on the rich will help the economy. That leaves one thing we can safely predict about taxes on the rich: They will bring in revenue. We could use some revenue right about now. No wonder conservatives always argue about what some model says should happen. The last thing they want is a discussion about what has happened. Are the wealthy like us is the mantra of the plebians that claims no, they are not? But in seeking tax cuts, the wealthy are indeed like the plebians in that they prefer easier ways to maintain the status quo, and tax cuts is that method – just as it is for plebians and government stimulus, i.e., entitlements, as interpreted by the wealthy. The key, then, is to tax the wealthy more so they will work harder to produce jobs, and that may be the reason that 41 million jobs were created during the higher tax rates under the Clinton administration. Tax cuts for the wealthy actually produces entitlements for the wealthy so they need not work harder to stay the same. This argument ignores the fact that the wealthy found a way to stay the same by outsourcing jobs which has not been fully accounted for in terms of economic prosperity and how it is achieved for the wealthy, but remains the primary reason that Americans have no jobs. Tax cuts at the top means more outsourcing which occurred during the Bush years to maintain the wealth created, including offshore accounts like Romney’s to prevent being subject to tax. When tax rates become the standard and the tool to determine who doesn’t lose, the wealthy have more to lose (they think) by tax increases, but the American people have more to gain by tax increases of the wealthy because they work harder, and that means creating jobs.